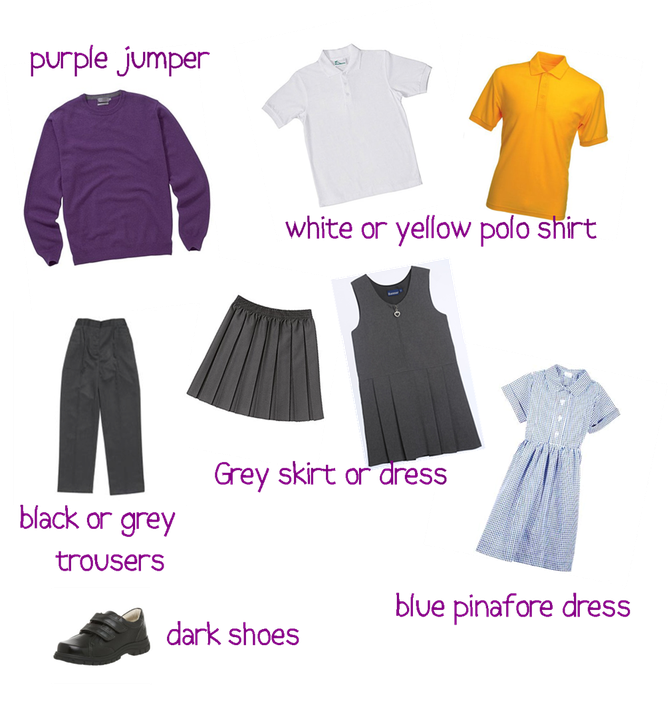 The school uniform consists of dark trousers or shorts (grey or black please) and a yellow or white polo shirt with a purple jumper. Girls may wear a checked blue pinafore dress or a grey skirt or pinafore dress in the Summer. Please ensure that your child has sensible hard wearing dark shoes and please ensure all items of uniform have the child’s name clearly marked. How Can I Buy My Child’s Uniform? If you have any queries, please don’t hesitate to ask the school office for advice. Please discourage your child from wearing rings, necklaces and watches for school. Earrings have to be taken out for P.E. and Games, as they can catch on climbing apparatus and cause a nasty injury. Teachers can take no responsibility for valuable items that may get lost during P.E. or swimming, and are not allowed to take the children’s earrings out for them. All religious jewellery will of course be respected. Please ask your child to leave their toys and valuables at home. The School has no liability for lost clothing or belongings, although we’ll do our very best to help you find them. P.E. kits are available for purchase or order from the school office. Our School Uniform P.E. Kit. Our Junior children need shorts, trainers and a T-shirt for indoor P.E. A tracksuit is useful for outdoor P.E. in the Winter especially. Our infant children should also wear shorts and a T-shirt for P.E. They need a pair of trainers for outdoor P.E. Our older children go swimming at Abbey pool. Please make sure that they have a swim-suit and a towel. In the unlikely event of your child being unable to take part in P.E. or swimming, please send us a note.